NOTE. Gordon Campbell Watkins was my friend for forty years. He freed me, as the Scots poet says, from many a blunder and foolish notion. We joined forces twenty years ago, when the basic data on hydrocarbon scarcity were starting to disappear. (Adelman and Watkins, 1996). A revised updated version was given in 2002 at an IAEE session in Prague. The last paper of our last effort follows, delayed by his death and my ailments. We are indebted to the Center for Energy and Environmental Policy Research at MIT for continuing aid. Without Therese Henderson and Jeanette Ehrman, the work could not have been completed. Errors in this final revision are mine alone. Nonparametric regression techniques hold out the promise of more flexible modeling of data in many areas of physical, biological and social sciences. However, their use is hampered by the "curse of dimensionality" which imposes enormous data requirements as the number of explanatory variables increases. After summarizing two of the most commonly used methods for mitigating the �curse�, this paper outlines a new approach which exploits data on derivatives. In economics, such circumstances arise in the joint estimation of cost and factor demand functions, or when production function data are combined with data on factor prices. The ideas are illustrated using empirical examples from energy economics. As an energy-economics modeler, who collaborated with academics while also consulting to government and industry, Campbell Watkins was especially interested in the empirical relationship between energy inputs and economic output. His skills were perfectly suited to this pressing research issue, which first emerged in the mid-1970s as the "energy-capital substitution" controversy. As his publication record shows, he worked with leading researchers in the development and econometric testing of dynamic specifications of this relationship. But he conducted this work always with a concern for how the research might be useful for immediate policy decisions. Today, the key policy question is the extent to which humanity can reduce its energy-related greenhouse gas emissions at reasonable cost. A new generation of �hybrid, top-down/bottom-up models attempts to address the objectives Campbell listed in his widely circulated 1992 book chapter, particularly his point that technological change should not be treated as completely exogenous, but at least in part as a very long-run response to price changes and policies. But while current energy models are increasingly constructed to incorporate this feedback effect � notably those models used for simulating climate policies � the empirical estimation of their key parameters is still in its infancy. As Campbell noted in his characteristic dry humor, the scope for research remains undiminished. More hard-nosed researcher-practitioners like Campbell would certainly help. We consider the impact of sequential investment and active management on the value of a portfolio of real options. The options are assumed to be interdependent, in that exercise of any one is assumed to produce, in addition to some intrinsic value based on an underlying asset, further information regarding the values of other options based on related assets. We couch the problem in terms of oil exploration, where a discrete number of related geological prospects are available for drilling, and management's objective is to maximize the expected value of the combined exploration campaign. Management's task is complex because the expected value of the investment sequence depends on the order in which options are exercised. A basic conclusion is that, although dependence increases the variance of potential outcomes, it also increases the expected value of the embedded portfolio of options and magnifies the value of optimal management. Stochastic dynamic programming techniques may be used to establish the optimal sequence of investment. Given plausible restrictions on the information structure, however, we demonstrate that the optimal dynamic program can be identified and implemented by policies that are relatively simple to execute. In other words, we provide sufficient conditions for the optimality of intuitive decision rules, like biggest first, most likely first, or greatest intrinsic value first. We also develop exact analytic expressions for the implied value of the portfolio, which permits the value of active management to be assessed directly. The Alberta oil sands, which comprise over 170 billion barrels of proven recoverable reserves, are a resource of an order of magnitude similar to many estimates of ultimate world conventional oil reserves. Campbell Watkins maintained a long-standing emphasis on the essential economic component of any meaningful definition of the world�s natural resources. The fact is that the Alberta oil sands have had a very shaky economic foundation until only recently. The intention of this paper is to examine this emerging resource from an economic perspective; one, it is hoped, similar to that which Watkins evinced, in order to fully assess the extent to which the Alberta oil sands may be regarded as being no different in any meaningful way from other oil resources. Concerns about the cost of CO2 capture and sequestration, and the effective�ness of carbon abatement policies loom large in discussions on climate change mitiga�tion. Several writers address the issue from various perspectives. This paper attempts to add relative realism to discussions on CO2 capture costs, and, the deployment of carbon capture technology in the UK by using publicly available company data on the long term capacity expansion and CO2 capture investment programmes of selected power plants in the UK. With an estimated �8 billion plan to install a generation ca�pacity of 11 GW and capture capability of 44 MtCO2/year, it is imperative to optimise this huge potential investment. A least-cost optimisation model was formulated and solved with the LP algorithm available in GAMS. The model was then applied to ad�dress a number of issues, including the choice of an optimal carbon abatement policy within the EU-ETS framework. 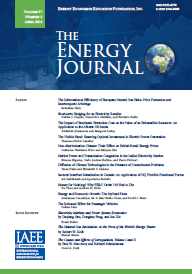 The major findings of the study include (a) the long term total cost curve of CO2 capture has three phases � rising, plateau, rising; (b) alternative capture technologies do not have permanent relative cost advantages or disadvantages; (c) Government incentives encourage carbon capture and the avoid�ance of emission penalty charges; and (d) the goals of EU-ETS are more effectively realised with deeper cuts in the EUA ratios than merely hiking the emission penalty, as proposed in EU-ETS Phase II.